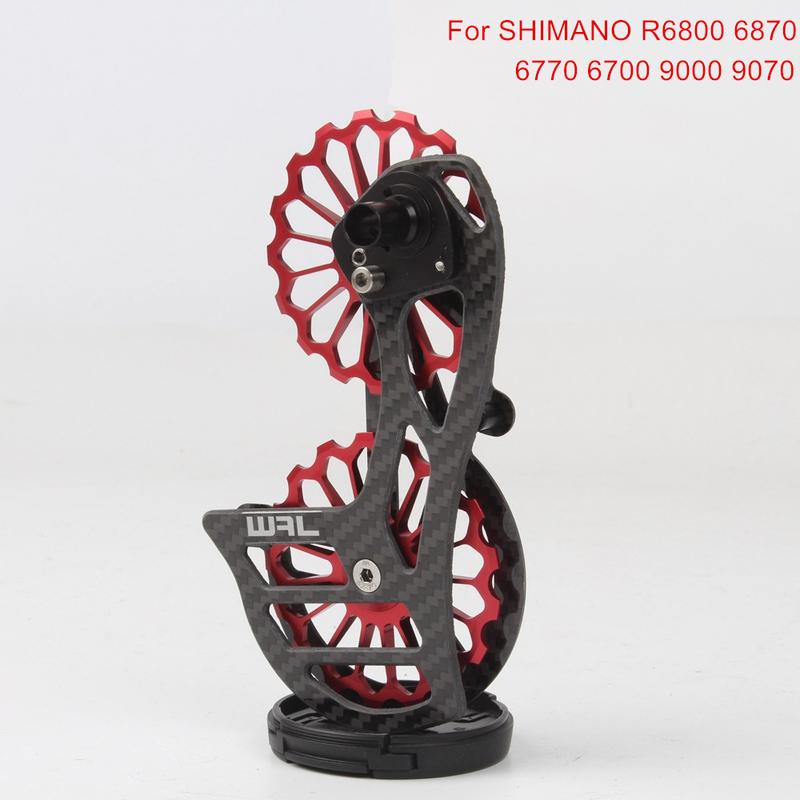 According to test result, increase the rear derailleur pulley wheel size could significantly decrease the friction between the chain plates caused by polygon effects during chain bending, and reduce the resistance for saving rider’s cycling power. The chain is composed of several short pieces with an inch long, we could see the chain as one inch long with around one hundred and ten section lines, due to small diameter of turning circle, when the lines pass through standard 11T pulley wheel, it needs a certain angle to turn the transferring direction of chain for about 180° through two wheels, after increasing the pulley wheel size, the chain turning angle are decreased, so the loss of friction is less correspondingly. The results shows that 17T is a good balance point between weight and decreasing the polygon effects, To increase the size blindly will lead to arc decreasing not obvious, together with weight and volume adding. Compared with common 11T pulley wheel, the friction loss caused by polygon effects of chain could be decreased about 60%. Besides, under the same transferring speed of chain, the axis rotation speed of 17T is slower for saving the self friction loss during bearing rotation, smaller cycle could also reduce the resistance of each turn rotation. To upgrade this ceramic bearing saves more power loss. Faster gear shifts. firstly, porous spring position limit could adjust back tension largely, improve the weakness of original weak stretch, and make the up and down chain tension between guide wheel and cogs much more adequately. Secondly, the contact tooth number or control tooth number between chain and cogs of rear derailleur 17T is more during gear shifting, it just like to pinch the middle and two sides of some sticks, the larger the control lever, the stronger the control power. Lastly, after redesign the cage\'s rotation curve, the distance between upper guide wheel and the cogs is improved. And we should also tell customer that the compatibility of 11-28T cogs, the length of chain is within the range of 405-410mm standard road bike chain stay, suggest using more than 114 links, but not too short chain, or it might lead to too large back tension and enlarge the tooth tip resistance between chain and pulley wheels. (In case customer just has short chain, suggesting install it to lowest tension of spring mounting hole). It can faster SHIMANO system up and down gear to improve 20%-26%. save 2.4 watts more.